This is the reason international friendlies never entice – if there’s nothing riding on a game of football, tedium ensues. Laca scored a beauty from a Mesut pass. I went to bed to read. Qarabag … 2 – so poor they didn’t even try to make it an entertaining game of football even though they had nothing whatsoever to lose. I got the feeling that Ozil wasn’t out there for as long as he was to get important game time but as a kind of sop to us poor souls who braved the cold. I can safely say that was a worse game to be at than even the recent 0-0 draw. On to Sunday, take your boots if you’re going, you might be needed. This entry was posted on Friday, December 14th, 2018 at 6:43 am and is filed under Uncategorized. You can follow any responses to this entry through the RSS 2.0 feed. You can leave a response, or trackback from your own site. Even she wasn’t laughing last night! And the wind would have been nasty around the Trossacks! I fell asleep during the second half. So cannot comment on the players performances. I was moaning all weekend about what a dull game Huddersfield had made and how it was the worst game I’d seen in years, since the dark days of Hull City and a million Eboue step-overs…didn’t think it would be beaten for Mogadon-like zombie state inducement and DEFINITELY didn’t expect it to be beaten so soon! On the bright side, a lot of those youngsters looked very good last night, although trying to draw conclusions when facing opposition that would struggle to keep pace with my boys u10 school football team…is tough. I could not understand Qarabag’s tactics. They were already out of the competition, so why not try and entertain? So what if they got hammered? Some managers have forgotten that football is an entertainment and if they do not entertain fans will stop being interested. I don’t think that Qarabag had enough collective talent to entertain. That match report made me smile more than most have in precent past. I started to write a comment which has turned into something that can loosely be termed as a post for tomorrow. Well it seems like I’m the odd man out as I was not that upset watching the game. I agree that it was not entertaining, especially for those that attended, but there were some positives. 1. Arsenal will save on the dry cleaning bill because Martinez did not get his uniform dirty. 4. Top of the group. 5. A few touches of magic from Ozil and Lacazette. 6. Our young talent strutted their stuff and some made their case for future involvement. 7. 23rd consecutive game unbeaten. 8. Saka is already a star at 17 years of age and will only get better – what a talent! 9. The youngsters inter changed positions with ease. 10. Unai Emery is our super star. Oops I was ahead of the fact – Southampton will be our 23rd unbeaten game. Memory ain’t what it used to be! Michael Owen has compared Arsenal youngster Bukayo Saka to Cristiano Ronaldo because he’s bloody mad. 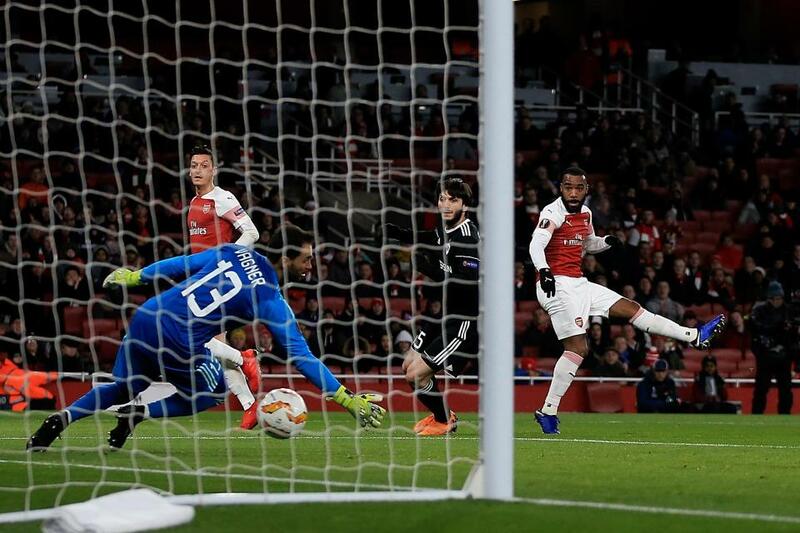 Saka made his Arsenal debut in Thursday’s Europa League victory over Qarabag, which extended the Gunners’ unbeaten run to 22 games. The 17-year-old made quite the impression, with Unai Emery praising “a good performance” and “a very big personality”. Emery added that the winger’s strength is “to continue trying to go one-v-one and break lines with his quality,” which Saka certainly did: the England youth international had four shots and completed eight dribbles in 90 minutes. But Owen has gone a little further, comparing Saka to bloody Ronaldo. “He looked really nervous at the start of the game, myself and Martin [Keown] were both talking about it,” Owen told BT Sport. Who was ever interested in Michael Owen’s opinion. Should stick to horses- on the same wavelength! Point 1 on your positives. One of the biggest cheers of the night came when Martinez dived to the ground to claim a “dribbled” cross, and I commented he gets a fine if there are no grass marks on his top! Michael Owen is a crap analyst but I agree with his opinion on Saka and more importantly so does Unai Emery. On reflection I expected nothing more from the game than an opportunity to see our “potential” future stars and I was very happy with their performances. I am with you, GN5, I just cannot stand Owen, but his views (and yours) coincide with mine — young Saka could be the dogs bollards! Another young un I like the look of is Medley who has the physique and the skill to become a bit special too. To be fair — if I had been able to attend the game like LBG, LB, Chas et al, I would be less than impressed too. That was the classic dead rubber on a freezing night – not nice! I wasn’t upset or unimpressed, in fact I enjoyed it and stayed to the end, I have even written a post on it that should appear tomorrow. I know there are plenty of people out there who are just dying to relive yesterday’s unforgettable moments. lol. No peaking. Micheal Owen might be a twit but I wish I had thought of comparing Saka with Ronaldo. Right, we have GN5’s traditional pre pre-match for today plus LB’s Qarabag thoughts. Should I slap them both together for double bubble? LB’s thoughts won’t really wait for another day as they’re so Qarabag relevant. The other alternative is adding GN5’s post to tomorrow’s pre-match. chas. We can start with one and then publuish the PM later in the day.